Pricing continues to push higher, but this is the first year that we've noticed measurable decreases in sales volumes. However, we're now seeing more sales volume in properties that were overlooked in prior years. Whether the previous disinterest was due to a building's age or the layout of certain floor plans, properties that buyers avoided in the past few years are selling this year. As each individual floor plan's inventory absorbs and pushes higher, buyers focusing on price begin to see value in remaining inventory. 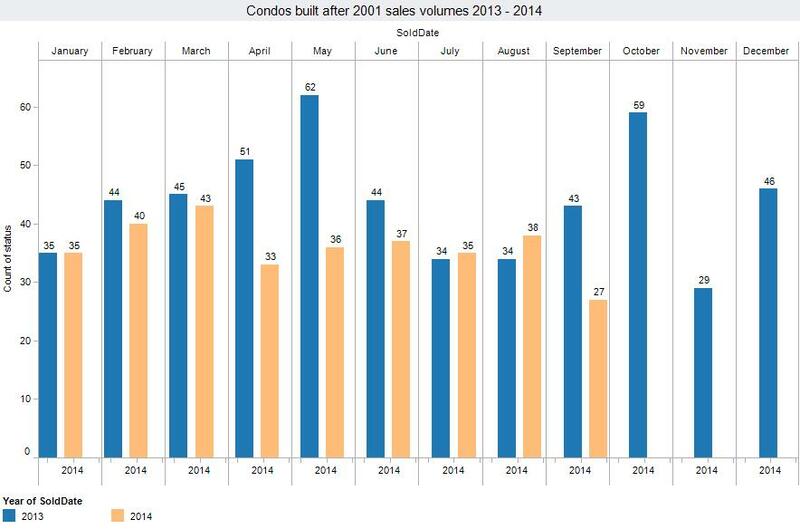 To demonstrate the overall downward trend, we're comparing 2014 sales volumes to 2013 for condos built after 2000. You can see here that sales volumes are noticeably lower in almost every month. When we take a closer look at condominiums built in 2001 or later, we see year-to-date sales volumes down by 17%. The graph above is an excellent illustration of sales volumes in every month over the last ten years. We can clearly see that 2014 is going to fall significantly short of the past three years' sales volumes. Sales for all gulf-front condos are also lower though to a lesser degree. Sales volumes here are down 9% year-to-date when compared against last year. Reviewing specific examples of decreasing sales volumes is also helpful. Calypso condominium is an obvious example of this. The three floor plans shown are on track for at least a 50-percent decrease in sales volume compared to last year. 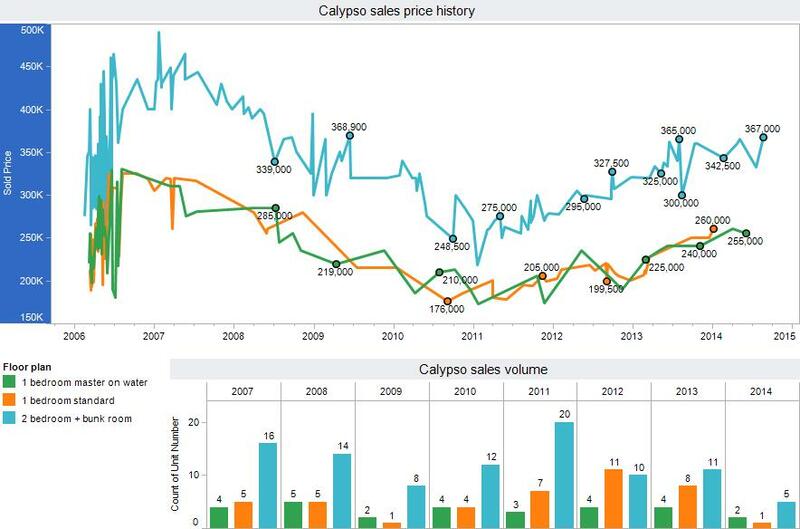 Calypso has been a leader in the pricing recovery that began in 2011. 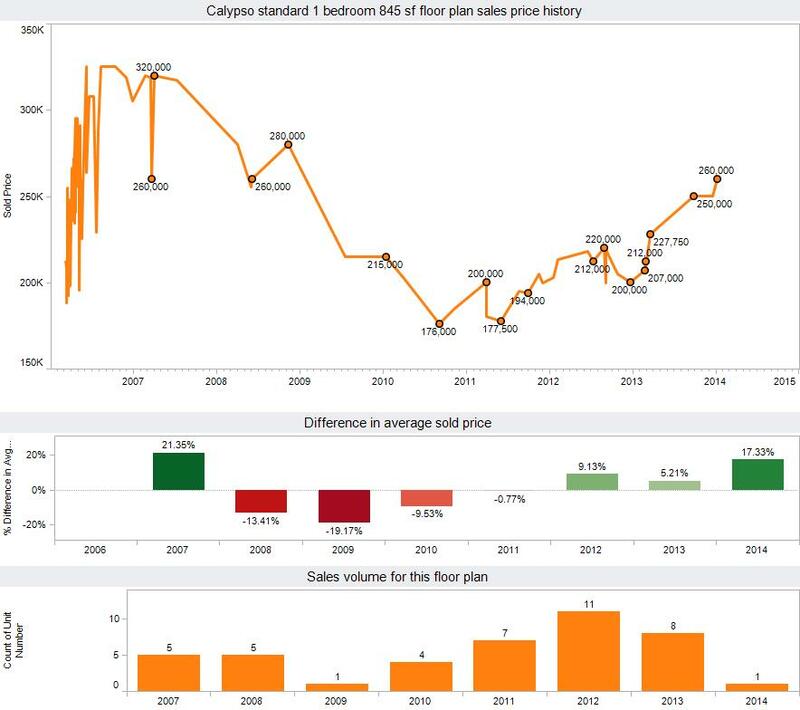 It also pulls a premium compared to most other buildings with similar floor plans, yet it clearly illustrates that some floor plans have seen drastically falling sales volumes in 2014. The standard one-bedroom at Calypso had eight sales last year but only one this year. There are currently 13 units on the market with asking prices starting at $262,000. With sales prices up over 17% this year we may have exceeded demand for now at current asking prices. Calypso's other two floor plans continue to sell but at an absorption rate of half what we've seen in the last four years. It's also worth noting that several buildings have floor plans with no inventory for sale at all. We expect this to be the new normal in Panama City Beach. Looking at the average dollar-per-square-foot price ($/psf), we're up 8.1 percent on average from last year. The graph is a little misleading because it shows the $/psf dropping from 238 in Q2 to 229 in Q3. Prices are not dropping for individual floor plans. The decrease is due to better sales of different inventory; units that weren't selling last year are selling now. The Calypso graph (two graphs up) is another great demonstration of this. 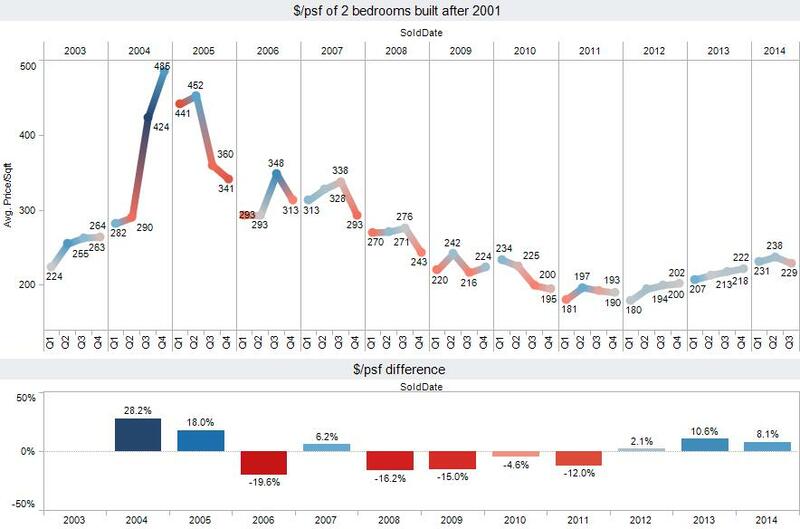 The standard one-bedroom floor plan isn't coming down in price; it just isn't absorbing right now. Currently, inventory is being absorbed, and prices are increasing for most floor plans. Although these things do not happen overnight, it could easily cost you 10% or more if you wait three to twelve months to buy. Price fluctuations for the same floor plan are largely due to whether the unit is unfurnished/poorly furnished or nicely decorated/upgraded. appreciation reaches the point where absorption falls off, prices tend to increase over time. Currently, many of the newer floor plans are selling below prices that provide the seller a net number at closing that is still more than 20 percent below the price they originally paid for preconstruction. As we reach that price point, we are seeing a large supply of inventory come on the market. The absorption rate has been much lower as prices have increased this year. While pricing is likely to push higher, it is a question of waiting the period of time it will take for buyers to pay the higher asking prices. Many properties will have asking prices $10,000 to $30,000 higher than several of the individual floor plans that are currently listed. This often occurs because of decorations and upgrades, like adding new tile to the kitchens and bathrooms. When buyers compare these units to those that have poor furniture, they see the value in properties with upgrades. Created on 03 October 2014 . Last updated on 31 December 2014 . Front Beach Road CVA project ? What's that ? To drive the prices of condos higher two things need to happen in my opinion. Investor cash flow from renting the condos need to continue to increase and we need to see an increase of baby boomers or people purchasing these condos convert them to primary residency. The FRont Beach Road CVA project is vital for the area to continue to grow and for investors to see increased price appreciation. The Panama City Beach City Council has long planed an overhaul of Front Beach Road. This Front Beach Road Project has already started and been completed in one segment in front of Boardwalk Condominium. There was a lot of documentation available and I provided links to the information in my June 2014 market update. The Panama City Beach website appears to have been updated and many pages and links appear to be broken. Hopefully this will be fixed in the future. Here is a recent news story that was posted on the next segment of the Front Beach Road project scheduled to begin construction.